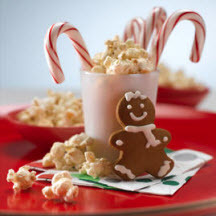 Here's a terrific low-fat, sugar-free holiday spiced popcorn snack mix that's ideal for those on restricted diets. Spread popcorn on baking sheet and spray lightly with the cooking spray. Combine remaining ingredients in a small bowl and sprinkle evenly over popcorn. Spray again with cooking spray and toss to coat evenly. Bake 7 minutes and serve warm. Makes 2 quarts; 8 (1 cup) servings..
*Regular granulated sugar may be used, if desired.